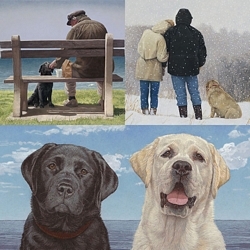 Image Size: 11"w x 12"h.
John Weiss’ paintings of dogs have an avid and loyal following. His popular, long-standing annual wall calendar “Love of Dogs” is one of Lang’s most popular styles. His lab and golden retriever paintings appear on greeting cards, mugs and journals. “Word of mouth has resulted in my works being sold all over the world,” he says. “There was even one portrait of a dog that was presented to Queen Elizabeth by Lady Barlow.” Weiss’ work is exhibited regularly and he won the “Cover of the Year” award from the National Dog Writers Association.